BOSTON (AP) ― State officials have announced plans to double the size of the Boston Convention & Exhibition Center, even though they have not said how they will finance the project. The plan announced Monday calls for a 400,000-square-foot exhibit hall behind the main center, a new 1,000-room hotel, a 5,000-seat auditorium, and a 65,000- to 75,000-square-foot ballroom. A proposal by the Massachusetts Convention Center Authority to expand its sprawling South Boston complex is being blasted by a top labor official despite months of secret meetings in a failed effort to shore up support. No details about how the expansion would be paid for were revealed in the 80-page report or a five-page press release. 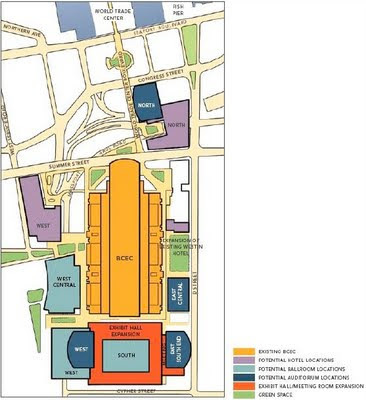 Despite a 21 percent decline in events over the last three years, MCCA officials said yesterday that the Boston Convention & Exhibition Center in Southie could support a 1,000-room hotel in addition to the existing Westin Waterfront, 400,000 square feet of added exhibit space, as well as 125,000 square feet of added meeting space, up to 75,000 square feet to accommodate a variety of uses and a 5,000-seat auditorium - to be built next to the Fort Point Channel neighborhood. The Boston Convention & Exhibition Center, already the largest building of its kind in New England, would double in size under an expansion plan unveiled yesterday by state officials, eventually becoming a 1-million-square-foot tourism “campus’’ on the South Boston Waterfront. The blueprint adds a 400,000-square-foot exhibit hall behind the main center, a 1,000-room hotel, a 5,000-seat auditorium, and a 65,000- to 75,000-square-foot ballroom elsewhere on the property. The announcement kicks off a yearlong planning process in which a 25-member committee of public officials and business leaders will try to finalize the build-out. But already some major hurdles have emerged: The Massachusetts Convention Center Authority does not own much of the adjoining land on which it plans to build, nor have state officials determined how to pay for a project that could top $1 billion. One official acknowledged state and city leaders will have to examine whether to raise travel and tourism taxes and fees to finance construction. Heywood Sanders, a professor of public administration at the University of Texas at San Antonio and a prominent critic of convention centers, is skeptical about the need for more space. He points to recent convention center expansions in Las Vegas and Orlando that generated minimal increases in business.